What a fantastic set of results for the ORC’s this weekend. The bracing cold weather still did not deter our hardy runners. You are all so inspiring! The grey skies and rain cleared away and there was blue sky and glorious sunshine even if there was a bitter wind that made it not quite as comfortable outside as it appeared from inside. Two races occupied the our runners this weekend; the Exeter City 10k and the beautiful but tough Hameldown Races. Like many of the fast, flat Exeter races, the 10k was sited at Dukes Meadow and Riverside Valley Park, using virtually a double lap of the Riverside Parkrun route but in reverse. Five runner’s took the opportunity to test their speed here with some great performances. Rob Kelly proved he was over his recent calf injury to have an outstanding run coming home in second place overall in an impressive time of 37.16, improving on his fifth place last year. 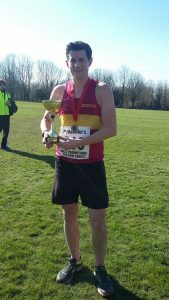 Chris Turner was next home for the club, also gradually coming back to form after an injury and finishing in 44.50. Mike Westland has also struggled to get consistent training in with some persistent niggles so he was pleased with his time of 49.14. Ged Fitzgibbon was next home in 53.26 with Jane Richardson in 1.04.54. The clear skies and sunshine made for really spectacular views for the runners of the Hameldown Races. 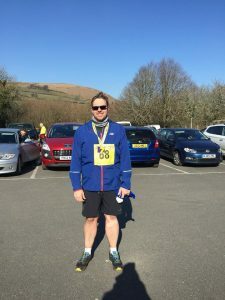 The Hameldown Hammer Half Marathon and the shorter Hameldown 7EVEN start and finish in Widecombe-In-The-Moor at the foot of the Hameldown ridge. The first three miles of both races are a tough uphill slog at the top of which the 7EVEN runners do a loop around Grispound and Hookney Tor before returning to the ridge to follow the path back down again. From Grimspound the half marathon route takes the runners left down to Challacombe before turning north then east, skirting Hookney Tor to form the second half of the hammer head that gives the race its name. 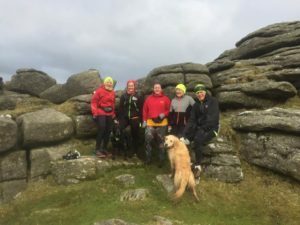 Here the biting cold wind was felt in full force before some shelter was found at Heathercombe, but the runners then had a second ascent of the Hameldown Ridge followed by a downhill return to Widecombe. Conditions underfoot were much improved by the freezing temperatures that gave the impression that the ground was dry though in fact it was just frozen, but wet feet could still not be avoided in some places. Two runners took part in the shorter race and for both Liam Keen and Denise Horner this was their first taste of trail running. Both found it a bit tougher than expected but coped well with Denise coming in ahead of Liam in 1.31.53 and 1.37.54 respectively. The Hammer had six runners, two of these having never run a half marathon of any sort and for one it was also his first trail race. This didn’t stop Tom Andrew, relatively new to running, from being the first ORC home in 2.28.40 and deciding that he preferred this type of race to road running. Gill Spinney was more used to off-road running but had never done this distance before finishing, however she ran strongly to be the next home in2.38.36 . Christine Fritsch, Jane Jackson and Mags Jarvis crossed the line together, Jane and Christine having run the whole race together and meeting up with Mags in the later stages. Do all look at the video on our facebook page coming in together on 2.46.59. Andy Humberstone had never run a race of this sort before, but ran really well and thoroughly enjoyed it coming home in 2.57.04. It off course is not possible to forget or ignore the wonderful moor runners, who every week seem to find some runners on the moor. A busy weekend and well done to everyone else who found the time to take in our beautiful environment and get some miles under your feet. 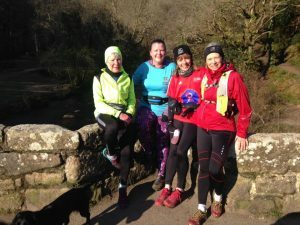 Many thanks to Jane Jackson for the run report as usual, and to Robert Richards for posting on the website. What! Only one person racing? Only one brave runner made their way to a race this weekend, (by the way we only found out by accident!). Andrew Vernon put in a fine result in the Bodmin Half Marathon. Now in partnership with Bodmin Road Runners, the Cornwall Fire & Rescue Service Bodmin Half Marathon is an annual charity event which takes runners from Bodmin College into the grounds of the National Trust’s Lanhydrock Park for two hilly, multi-terrain laps offering stunning views. Andrew managed to clock a time of 1hr 42mins for this hilly course. Alas, we did manage to get some keen moor runners out on the weekend. Clearly getting ready for the spring and summer months ahead of us. This fine crew will have a leap on us couch winter runners when we start up the Tuesday moor running in the coming months. As always please ensure you tag your event on the facebook page so that Jane and I can report on it, include a photo as well. One other request, as we are fast approaching the granite way races (4th March). As usual we could do with some marshals. Free places to anyone who brings a marshal or helps set the course. Although this isn’t our race we do earn money from it. Do let Andy Vallance know of your support. Many thanks to Jane Jackson for the run report and Robert Richards for the editing. The weather hasn’t been very kind to runners this winter and this weekend was no exception. While there can be a sense of great satisfaction from completing a tough race after battling with the elements, some races really need a fine day to be appreciated properly. This was the case for the six brave runners who ran the Dartmoor Trail Challenge on Saturday. This race wasn’t held last year due to calendar congestion, but organisers, Trail Events, hope this will be a permanent date for it in future. There are four route options, 12k, half marathon, full marathon and ultra, but all the ORCs thankfully opted for the 12k on what turned out to be a vile day. 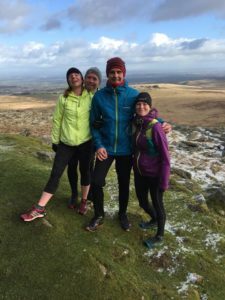 With the event’s description of all there was to see in this lovely part of Dartmoor around Hound Tor and Haytor Downs, the runners were looking forward to an enjoyable and scenic run. In conditions of freezing winds and horizontal rain however the reality was a bit different and all six were pleased to just get round, however they all did better than they expected and it turned out to be quite worthwhile after all. Chris Fullford Brown was the first home in 1.50.24 to be 2nd MV60. He was followed by Carole Cornwall in 1.53.43. to take 1st FV50, sharing the same time as club mate Katy Speak who took 2nd FV50. Janet White took 1st FV60 in 1.56.42 and Ruth Bushell completed the sweep of the FV50 group prizes by coming third in 1.56.32 with Claire Sprague finishing in 2.15.17. 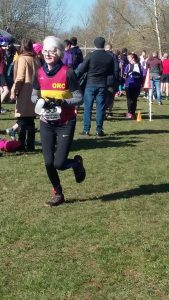 The next day proved no better for the club’s runners at the penultimate meeting of the Westward League cross-country series, held in Central Park in Plymouth. Here it was there weather of the whole winter that affected the conditions, with the entire course being reduced to a muddy slop of varying depths. On a twisting, hilly and sometimes steeply banked course it was hard enough to stay upright never mind try and run a competitive race. The ladies team were the first to race so had the advantage of a slightly less churned up course, but they were treated to a violent hail shower over the first part of the race that made it hard to open their eyes and see where they were going. 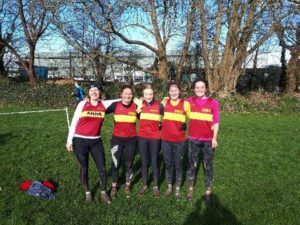 Molly Marvin had a great run despite the conditions, to come in first for the club in a very good position, with her mum Sarah a little further behind than usual having twisted her ankle playing hockey the previous day. Gill Spinney was next followed by Jane Jackson and Anne Binns. Most of the ladies have now completed the required five races for the series so need not compete in the final race. By the time the men ran there was little grass left to see, but Okehampton’s Paul Crease put in an incredibly strong run even so to come in first for the men with Andy Vallance next. “Mr Marathon”, Roger Voaden, showed his versatility having been drafted in to bolster a men’s team that has been hit recently by injuries. More accustomed to feeling the tarmac under his feet, he coped well with the mud to finish next and ahead of his marathon training partner Paul Carter. They were followed by Stuart Page and Andy Humberstone. Not forgetting the regular Moor running group who always seem to find someone willing to go out on the moor. 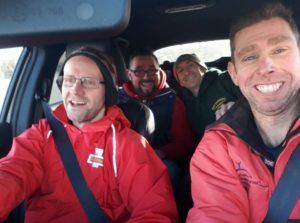 And finally, who can name the tune they are singing in the Andy Vallance Carpool Karaoke. Injuries, weather, tiredness and many others things that haunt us all, however despite all this we still manage to find someone who is racing at the weekend. Not to mention those pesky Moor runners are at it again. A duo of Club ladies took a trip to the seaside on Sunday to take part in the Fulfords Five race around the streets and seafront of Exmouth. Organised by Exmouth Harriers with the support of Fulfords, this five mile two lap race is not only one of the first opportunities of the year for serious road athletes to dust off their racing shoes, but also an ideal distance for those new to the sport to have their first taste of competitive running. In a change from the dull wet days of recent weeks, Sarah Marvin and Jackie Dawes were treated to a crisp sunny morning with little in the way of wind to slow them round the fast flat course. Sarah came home first with a terrific run to finish in 35.56, earning her second place in her FV45 category and setting both new age group and overall club records for the distance. Jackie also had a very successful day, securing third in the FV50 category and also setting a new club age group record with her finishing time of 39.09. Bracing the cold, but crisp winter sun, a small group of Moor runners made it out again. As always anyone is welcome to join. Do keep an eye on the club Facebook page to see who is going and when, just invite yourself. Finally a reminder for you all, please put your race details on the club Facebook page with any photos you wish to share. This makes Jane’s job so much easier, as well as removing the possibility that we miss your event. After all, the hard work you all put in to the training and the excellent results you all keep achieving we wouldn’t want to miss you, would we? Error: Error validating access token: Session has expired on Saturday, 20-Apr-19 03:20:42 PDT. The current time is Monday, 22-Apr-19 11:39:01 PDT.